The legend of Joe Cosley is one of an expert trapper, decorated soldier, ladies man, and a truly thoroughbred mountain man. 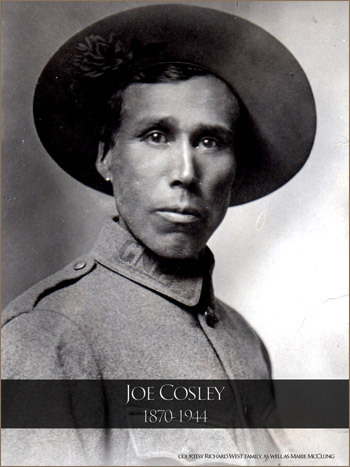 Born to a French Canadian trapper and an Algonquin mother aboard a boat on Lake Huron, Cosley’s early years were spent in Ontario and various parts of the United States. Before Joe turned twenty he was living in Montana spending his time in the backcountry of Glacier, trapping and working as a U.S. Forest Service Ranger. Joe Cosley built the first Ranger station in the Belly River region around 1908, a building that still exists today as a Ranger compound barn. In 1910 Glacier National Park was formed and Joe became one of the Park’s original Rangers, selected to protect and patrol the Belly River region. With the formation of Glacier National Park came a ban on trapping and selling furs, something that he had been allowed to do as a Forest Service Ranger. But Joe was a born and bred trapper through and through and instead of protecting his region of Glacier, he turned it into his own private trapping dominion, selling his furs and hides in Canada. Rumours of Cosley’s activities got back to his superiors in Glacier National Park and when they sent Rangers after him in 1914, he escaped and fled to Canada. Joe joined the Canadian military and left for Europe which was embroiled in the early stages of the First World War. Always a crack shot, Joe Cosley became a decorated sniper with a record of having killed sixty Germans.After the war Joe returned to the Belly River region and for a decade he continued to trap with impunity, eluding Park Rangers at every turn and escaping into Canada to sell his poached furs and hides. At trial, Joe was found guilty of poaching and possession of firearms, traps and hides. Cosley was sentenced to 90 days in jail and fined $125 but by again feigning illness, the Judge chose to suspend Joe’s sentence and local friends paid for his fine. "Next morning Thom Whitcraft and I took the train back to East Glacier and drove a Model-T by way of Cardston to the Canadian Belly River Station. From there we had to walk, but we weren’t too concerned. It was about 30 miles from the town of Belton to Belly River and today that takes a good strong hiker about two days. And that’s if he’s on good summer-cleared trails. But when we got back to his camp all we found were tracks. During the course of the night, that 59-year-old man had snowshoed up McDonald and Mineral Creeks, crossed over Ahern Pass and removed 40 to 50 beaver blankets and somehow disappeared from the Belly River Country. We couldn’t have missed Cosley by more than a few hours. Maybe only minutes. What luck! But to this day you know, I’m not sure whether it was his good luck or my good luck. You see, after that he went north into Canada where I’ve been told he trapped, wrote old girl friends and became quite a legend." Indeed, Joe Cosley did head north, continuing to trap in the boreal forests of Canada into his 70s. In 1944, Cosley’s body was found in an old trapper’s cabin about 400 miles North of Prince Albert, Saskatchewan, apparently having suffered from scurvy. Joe Cosley’s mark upon the Waterton-Glacier region remains to this day. Several Glacier National Park lakes bear the names of Joe’s sweethearts: Helen Lake, Sue Lake, Elizabeth Lake and Margaret Lake were all named by him. There is also a Cosley Lake and Cosley Ridge. Joe was also known to have carved his initials in hundreds of trees; one such example can be seen today preserved in the Waterton Heritage Centre. In addition to his initials, Joe, long known as a womanizer, used to tell a story of a diamond ring he purchased for $1,000 in Paris, but being spurned of his proposals by several women, he cached the ring in a tree in Glacier where perhaps it still remains waiting to be found.